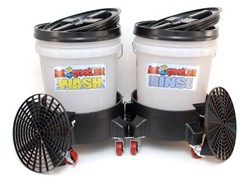 The Grit Guard Dual Bucket Washing System makes washing your car safer and simpler. With a wash and rinse bucket, you can keep your wash water free of dirt and paint-scratching particles. The Double Dolly ties it all together. Your Grit Guard Dual Bucket Washing System rolls wherever you need it to make washing easier and more beneficial for your vehicle! The principle behind the two bucket wash method is simple: by rinsing out the wash mitt before reloading it with soap, much less dirt is returned to the vehicle. Therefore, scratching is less likely. Use the two bucket method once and you'll be hooked. Just look in the rinse bucket when you're done washing for proof positive that the two-bucket method works! The Grit Guard Dual Bucket Washing System takes the idea of the two bucket method and makes it a reality - on wheels! Now there's no need to run back and forth from the wash bucket, losing valuable suds along the way. The Grit Guard Dual Bucket Washing System rolls around with you on multi-directional casters. Your wash and rinse buckets are in easy reach while you work around large vehicles, RVs, and boats. Use one bucket for soapy water and one for rinsing. This two bucket method helps keep dirt from being transferred back to the vehicle. 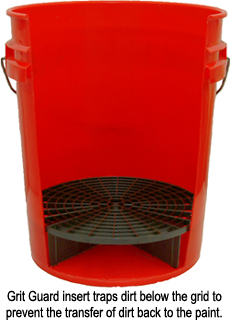 Each bucket has its own Grit Guard Insert and Gamma Seal® Lid. The Grit Guard is a raised grid surface that sits in the bottom of the included 5 gallon buckets. Fill the bucket with your favorite shampoo and water and place the Grit Guard in the bottom. Load your mitt with soapy water and wash as usual. When you dunk the mitt back in the bucket, drag it across the grid to remove dirt that has accumulated in the nap. The dirt will fall between the slats and settle in the bottom of the bucket. Even though you agitate the top water every time you reload the mitt with soap, the Grit Guard stabilizes the water in the bottom of the bucket so the dirt does not rise. These lids form a watertight seal. You can fill the buckets with water and transport them without the lid leaking! For car collectors who participate in car shows, this is a great feature. Believe it or not, some of these enthusiasts use nothing but distilled water on their vehicles and they’ll actually bring it to the car show if it’s not available on site. That’s dedication! The lids also keep dust out of the buckets when they're not in use. No wash bucket is complete without the 5 Wheel Car Wash Dolly! The dolly accommodates any 3.5 - 7 gallon round bucket and has 5 heavy-duty casters capable of supporting up to 250 pounds. The dolly makes your wash bucket mobile so you can easily roll it around a vehicle as you wash it. Two locking casters hold the dolly still on an incline. Three thumb screws hold the bucket in place inside the dolly. The durable, metal casters turn in any direction to give the wash bucket unlimited maneuverability. The Diamond Plate Dolly Connector is perfect for detailers who use the two-bucket wash method. One bucket holds the soapy water. The second bucket holds clean water. Each time you need to reload the wash mitt with soap, first dunk it in the bucket of plain water to remove any dirt you’ve removed from the vehicle. Then reload the mitt with soapy water. Continue in this manner until you’ve washed the entire vehicle. You’ll be surprised at how much dirt you’ve kept off the vehicle! If you use the two-bucket system, you may already have two buckets with dollies, but you still have to move two buckets separately around the vehicle. Keep everything together with the Diamond Plate Dolly Connector. 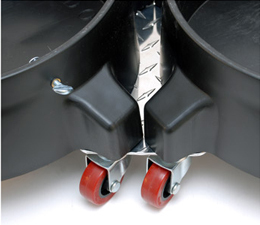 The Diamond Plate Dolly Connector simply connects the two dollies to keep your two buckets side by side, right where you need them. The Grit Guard Dual Bucket Washing System is ideal for pro detailers and anyone who is serious about good detailing practices. The system makes the two bucket method truly convenient, and your vehicle will have fewer wash-induced swirls. By using this system, high quality products, and microfiber towels, you'll maintain smoother, swirl-free paint! A total retail value of $139.97. Save $19.98! This system is expensive but it's complete. The dollies and the lids add a lot of cost. The buckets come with grit guards which are a must. I wish it included at least one washboard with it though. If you have a flat driveway the buckets on wheels really are nice as they follow you around the car, saving time and effort.